Nat Torkington writes the Four Short Links column for O’Reilly’s Radar, highlighting interesting articles around the web on a daily (or near-daily) basis. Recently, he’s pitched me a few links via e-mail under the heading “WCYDWT?” which, due to my fallen nature, I have taken as a challenge to my sacred honor. 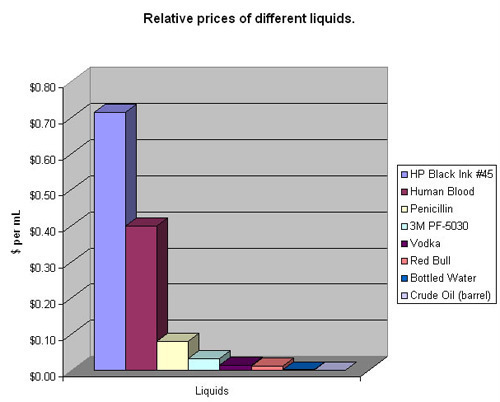 Here’s one: the relative price of different liquids which illustrates the disturbing fact that HP printer ink is several orders of magnitude more expensive than crude oil. So I opened our first day back from winter break with a learning moment built around Nat’s link and then recorded video of the moment which you’ll find below. My apologies in advance for the pitiful production value. Initially, I was going to forward this only to Nat as some kind of retort but I found the experience so difficult, messy, and exhilarating, I had to debrief myself here. Notwithstanding the video quality, you’re welcome to pummel me for anything you see. 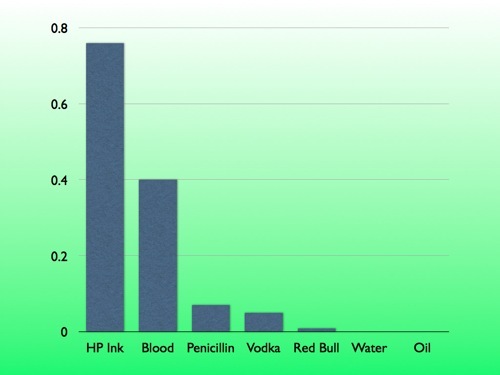 Classroom Video — HP Ink Costs More Than Blood from Dan Meyer on Vimeo. Which is a weak start. A certain kind of student inevitably dominates these pseudo-Socratic discussions and then invites another kind of student to disengage. But Nat has dealt us a strong hand. If we play those cards right, we can retain and empower a lot of those (mathematically and conversationally) reticent students. 1. Calm down with the math for a moment. Invite their intuition. At one point in my career, I would have led this off by giving them all the data and asking them to compute the ratio of cost to volume. but my blue students are poorly-served by that approach. So many of them have been burned so badly by math that if I open the conversation with terms like “ratio” and “volume,” pushing numbers and structure right at them, I’ll lose the students I want to keep. Moreover, this confuses master with slave. We use math to make sense of the world around us more often than the reverse. Ask a student to come up and share her ranking with the class. Argue a bit. Entertain opposing opinions. Ask a student if he’d trade a can of Red Bull for a can of his own blood. Student investment at this point is very nearly 100%. It’s mine to lose. 2. Slowly lower mathematical structure onto their intuition. “Here’s the answer,” I told them, but students know at this point to triple-check me. Several went straight for Red Bull, which totes does not cost $51.15. We used cell phones to text Google and ask for unit conversion. This always strikes my students as magical and suspicious. And here, finally, we talked about the ratio of the cost of blood to how much blood you get. I asked them to visualize one milliliter of blood. 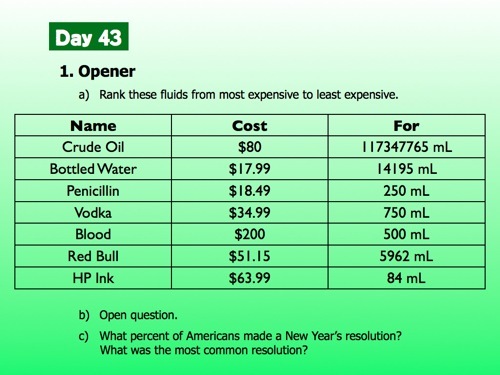 “What does .40 mean?” We talked about the cost of one milliliter and how it’s useful to compare that cost across liquids. The rest (hopefully) writes itself, though, for the record, I kind of hate how explain-y I get in the last third of the video. Find an interesting thingIt’s sad how often the conversation with other teachers ends here, after it becomes obvious that they just aren’t interested in all that much..
Transform that interesting thing into a classroom challenge. Help your students develop tools to resolve that interesting challenge. The feeds in your reader then spiral upwards and out of your control. WCYDWT ideas begin to pile up faster than you can capture them. It’ll freak you out and you’ll wish you could turn it off for just a few hours while you’re watching TV but you realize this a rare ancillary benefit in an occasionally tortuous job and you accept it gratefully. anecdotes, what can you do with this? The obvious (to me) interest hook is to leave out the red bull (and probably vodka, but that’s because middle school kids would get all crazy about booze and forget where they are). Then leave a blank spot in there, for them to put their favorite liquid. Might be Redbull, might be Dr. Pepper. Might even be a 40 of Steel Reserve. But at that point, they’ve put some of their investment on the table – they’ve got something of theirs in the pot, and that makes them less likely to fold their hand. It would be awesome to have an oil drum in class. Slam that baby up on the table and then daintily place a print cartridge next to it. Show them the price for a barrel of oil and then the price for an ink cartridge. Nice. Nice flow into a math lesson from the table Nat gave you. Tell Nat, though, that his table lies. Your intuition was more accurate than the numbers. Consider the price of gasoline, at about $2.60 per gallon. 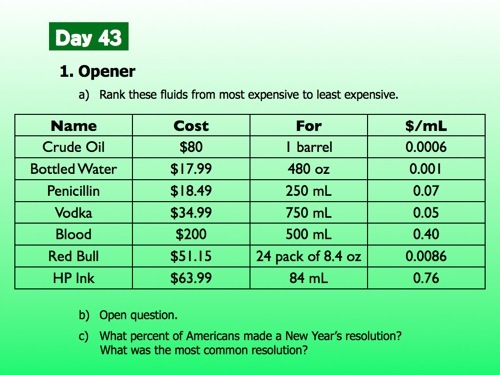 There are 3758 ml per gallon, which yields $2.60 / 3758 = $0.000692 / ml, just slightly more than crude oil. You said gasoline was expensive. Yeah, it is. We think so. Numbers lie when we make inappropriate comparisons. An equal volume comparison here is a sneaky way to lie with numbers. Actually, economics requires a lot of math. Supply versus demand; utility. If my printer cartridge had a milliliter of ink, I wouldn’t change it yet. I could still print with it. If my car had a milliliter of gas left, I couldn’t get out of the driveway; maybe I couldn’t even start the car. But let’s do the math. Say a car gets 25 miles per gallon, that’s 25 x 1760 yards = 44000 yards per 3758 ml of gas. That’s just less than 12 yards per ml, more than I thought it would be. The point, though, is that the volume of ink needed to be of practical value is far less than the volume of crude oil or gasoline needed to be of practical value. In inferential statistics, a distinction is made between statistical significance and practical significance. If a result is not of practical significance, then any statistical significance is meaningless. Likewise, an equal volume comparison here is meaningless. Glad I saw this before we jump into volumes in the next couple of weeks. It was a well-constructed path. Thanks, Dan. This is easily one of the most useful things you’ve put up. I’m also wondering – do you teach this before the nickel thieves, or after? Or are they even related as much as I think they are? @Mr. K, in general I favor students leading the creation of their own challenge material but what’s less obvious to me than it must be to you is how, when a student picks (eg) “Mott’s Apple Juice,” she has any kind of accurate idea of the volume of the apple juice or its cost. And to be honest, I forgot completely about the nickel thieves and how perfectly the two exercises follow each other. My instinct would be to use the nickel thieves first, simply because the mass of the coins are all given in grams, which sets some context for unit conversion in the Crude Ink problem. @Burt, thanks for taking me to school back there. I’ll dial back my pitch for the meaning of the statistical comparison (ie. “ink is exorbitantly overpriced.”) while maintaining my pitch for its general interest. @Doug, thanks. Even though these posts soak up a few extra hours on top of planning, blogging has turned out to be something of a defense against burn out. Which shouldn’t surprise me as much as it does. Dan, FWIW, in an apple to apple comparison, actually HP ink is expensive now. I could get 5000 pages of text from $50 worth of my old HP Laserjet cartridge, but less than 1000 pages from $50 worth of my HP cartridges today. My cartridge today costs more than 5 times as much per printed page as my old cartridge. That doesn’t take anything away from how well you set up that lesson. Nice job, and thanks for sharing it. Nice. It’s cool to see not only how you turned the interesting bit into an opener, but to see how that translates into both delivery and amount of class time. I love that you not only allow but encourage kids to use whatever tools they’re already carrying, ie. texting google and using cell phone calculators. Do you find that you hit a point where you have to transition and emphasize that kids bring “proper” calculators so that they’ve got something they can use on a final exam? Or can you get away with this awesomeness all year long? I’m with Steve. I realize how far I am from where I should be. I entertained the idea of splitting my Alg II classes into groups of two and then conducting a fantasy football draft. They would learn about spreadsheets and using formulas (algebra) to determine the scoring system. Problem is, then what do you do? Where do you go with it after that? I thought about rotating responsibilities for presenting results and league standings each week so they could also work on presentation skills. It just seems like one of those ideas that sounds good on paper, but doesn’t materialize into very valuable returns. Any thoughts? It would be great to throw the cost of a venti mocha frappuchino in the mix. Coffee is getting way up there in cost, and the kids don’t think twice about laying down 4 bucks for a cup. At the beginning of the fall semester I was trying to come up with any possible activity I could get the students involved in that related to math. In fantasy football you establish a scoring system such as 1 point for every rushing yard for a running back, 6 points for each TD; 1 point for every 20 passing yards for a QB and 4 points for each TD, etc. The students would have to establish the scoring formulas and they would also build up some Excel skills. The reason I posted that comment was precisely the question you asked. I got to the point where I looked at what I had proposed to myself and couldn’t see what long-term, self-perpetuating benefit anyone (students and teacher) would gain after the initial week. I was hoping that someone else might have some insight or a different slant that would add to the idea. I’m with Steve and Craig- I can’t teach this way yet because my brain isn’t aware/smart/intuitive/mathematical enough to first notice these things, then develop a lesson, and actually deliver and make sense of it. I love your ideas but I just steal them without understanding how to create them myself. I am inspired. Not only by the depth and breadth and comment discussion of this post, but by the idea that blogging your teaching approach – the plan of learning attack – keeps you championing your pupils progress and respecting their ability. Went on to read other post: http://blog.mrmeyer.com/?p=5080 on blue students. Great stuff. Thank you. More please. I’ve been lurking on your blog for quite some time now, and I’ve finally felt the need to comment. Being a second year teacher, I’ve really gained a lot of insight and perspective from reading your posts here. This particular entry has been very beneficial to me and I really appreciated seeing the video alongside the slides you were showing in the class. As I continue to follow your blog, I am slowly becoming more and more aware of the accessibility of math in everyday occurrences. This is a great thing you’ve got going on here. I am glad to have found this place. Years ago (at least 15) I wanted to do the same thing with my 8th graders, so I started a fantasy basketball league well before yahoo and other online leagues. Without going into details, each player on each team was assigned a “score” based on a formula that the kids and I came up with (we referred to this formula as our Power Ranking Formula). After that first season, a group of kids wanted to change the formula. As is stood, the more stats you accumulated, the better your Power Ranking. The students wanted to change the formula to reflect the number of minutes a player played each week, their rationale being a player who, say, had 4 blocks in 5 minutes of play was just as valuable as a player who had 8 in 10 minutes. They also felt that a player who had assists was just as valuable as a player who had blocks or steals, but they were not sure how these stats compared. I simply asked them to do some historical research on league stats to answer this questions and to come up with a new formula. Well, they did, and they revamped the formula every year until Yahoo took over. Another thing that happened, at some time during that season, kids began to trade players based on NUMBERS not NAME. That was pretty cool. Great idea. I like the approach and the instructional methods. I am thinking of a way to use this data and put a history/social issue spin on it that will have students evaluate a particular issue. One could change the actual items if needed. Something like needs vs wants, etc. I’ll let you know when I think of it. I really like the activity and the approach. It is also very brave to record your lesson and put it on the internet. I’m glad you did because what I thought transpired during lesson while reading your post was different from what I watched. You wrote: “I kind of hate how explain-y I get in the last third of the video.” I agree. At 6:00 you say “Which of these seem like a good deal to you?” Brilliant! But after that, your slides answer that question for them. It seems it would have been easy for a student to be lazy and sit in the back and watch you do all the work as the slides unfold. After you asked “Which of these seem like a good deal to you?” I would have put the students into groups to answer that question themselves and to generate hard data to support their claim. Each group would get a transparency or whiteboard to write their solution. Then I would circulate around to coach the kids when they got stuck. They need to struggle…it is essential to the learning process. I would give a group the unit conversions when they ask for it. Finally, the groups would present their solutions to the class or we would display all the solutions and I would ask questions as we compare and contrast methods. (1) Some groups convert to different volume units. Although the time saver is to convert to mL, I bet some groups would convert to oz. or gallons because that is what they are used to. (All my physics students think weight MUST be in pounds.) Great place to discuss which units are “best” to convert to and why. (2) Some groups do cost per volume (how much do you pay for 1 mL of ink, oil), while others do volume per cost (how much ink, oil do you get for a dollar). For some kids its more intuitive the second way. (3) Despite the fact that one group’s list is in $ per oz, and another is in mL per cent, and all the lists have numbers are crazy different, ALL the rankings come out the SAME from most expensive to least expensive. And that is the true power of ratios. Now I don’t know your students’ ages, abilities, or maturities, nor do I know your constraints for this activity (was it unrelated to the day’s lesson, was it part of a bigger plan, were you pressed for time). But you were definitely “on stage” the whole time. I’m not saying I get all my kids participating all the time. But the more ownership we give our kids in finding the solution, the better. Thanks for sharing. Did the exact activity (minus your obvious charm) today at my Saturday morning extra learning session (Algebra I). The kids really enjoyed it! I’ve been using your assessment methods this year with much success. I agree with you in this post that it is virtuous to teach in this manner and would love to eventually have one of these for each of the concepts I use in my classes. I have a couple of far inferior versions that help me teach systems of inequalities rather effectively. Thanks again! Frank: Now I don’t know your students’ ages, abilities, or maturities, nor do I know your constraints for this activity (was it unrelated to the day’s lesson, was it part of a bigger plan, were you pressed for time). I appreciate the out you left me there, Frank. We’re talking about remedial Algebra, freshmen, a couple of sophomores, one junior, the lowest class my school offers. I have a lot of mainstreamed students with learning disabilities, most of whom range from one to four years behind grade level. A lot of split families, poverty, and one criminal record of which I know. Poor students skills are the rule not the exception. Pretty crucially, most have had demoralizing experiences with math in the past. I find this group exceptionally interesting and exceptionally challenging but I’ll cut the description there. I would love to send my students off into groups with some basic scaffolding and return a half hour later with some compelling student presentations. It seems a bit, well, fantastic right now, so I feel compelled to stage manage the learning experience more than I’d like. If you teach anywhere close to the same student population that I do, I’m wide open to solutions. Frank: But you were definitely “on stage” the whole time. Quick defensive note: there are ellipses throughout the clip where I sped up the footage of student work and dialogue. The clip would have been close to half an hour had I included them. I’m having trouble seeing the point of this exercise. What are the students supposed to be learning? Is it: How to sort a column of numbers? How to convert units of measure (by texting Google)? How to determine if a liquid commodity is expensive (by comparing price per unit volume)? Hopefully it’s not the last, since as Burt pointed out, the equal volume comparison is really meaningless. Zeno, since you mentioned my comment, I’ll give you my take on the point of the lesson and of Dan’s post. The lesson is about comparing the price of different items and the need to use ratios to equalize their value, so the prices could be compared based on equal value. It is essentially a lesson on ratios. Frank made some excellent comments about how to deepen students’ understanding of ratios. I see my comment as separate from the math lesson. I was raising a practical issue about the real world context of the math lesson, and the assumption made in the chart that Dan was given and used in the lesson. I think the practical issue is worth a comment to the class, but it doesn’t invalidate the math lesson on ratios. Actually, volume could be a valid dimension to equalize the value of different beverages, but you wouldn’t buy a whole gallon of ink, nor would you buy only one gallon of gas, so volume doesn’t work for disparate items. But in making my comment I didn’t mean that the math lesson was pointless. I especially want to address the point of this post. I applaud Dan for sharing his ideas and his lesson in such detail. I also applaud Frank for giving constructive criticism. I think it is brave of both of them to do so. And I think to see this kind of sharing is exactly what any teacher needs to become better at teaching. I know I need to see this kind of detail to truly understand what anyone is saying. I think without concrete examples, words are interpreted based on what the readers/listeners know, so it is hard to convey a meaning that is different from what they already understand. We need to see the words in action to stretch our minds. So thanks Dan for sharing in a way that is most useful to your readers, even if it makes you more open to criticism. And because it does make you more vulnerable, I appreciate it even more. It’s scary to see an email turned into an hour-long encounter with real students! I’m grateful for the video, not least because I was really curious about what life’s like in your classroom. It’s not the perfect inspired teaching moment that I’d pictured your lessons as, and that’s greatly comforting. I noticed that there was a lot of background chatter at the start, including a very audible “I don’t know what we’re supposed to be doing” from one student to another. Yet by the time you’re doing conversions, they’re engaged and quite quiet. I’ll echo Steve’s comment, I read this site and I feel like a fraud. I don’t know anything about teaching math. @Burt: Good point on including economic utility of the fluid in question. Maybe ink costs so much because that’s what people will pay for it. More political than most, but I loved the creative thinking. Long-time lurker (not even a math teacher), have to comment on this contribution by Dan, though. Such an interesting lesson and exchange between students and between you and students. Thanks for putting it out there. I had the same reaction a Zeno: how expensive is gas really? I can’t agree that the solution isn’t appropriate for the ‘real world’ question, but rather that it opens the possibility for the students to continue to think critically about what we think we ‘know’ about the real world. “we all know gas is expensive.” Really? One could also go back and and try to see what all those mL really get you? How many sheets of printed paper / how many color photos? How many miles? How many calories? etc. So many interesting possibilities. Thanks, Dan! the disturbing fact that HP printer ink is several orders of magnitude more expensive than crude oil. Only if you discount the design and the electronics in the ink cartridge to 0. Try using the “expensive” ink without the cartridge. Or try substituting a less expensive liquid for ink when you refill a cartridge and let us know how that works out. Thanks Dan, for this post. Your inclusion of video takes your level of scholarship through the roof. I appreciate that you make your thinking (and our responses to it) public and so easily available. I am thinking of using this as an opening for an algebra lesson to surface some critical foundations in ratios and proportionality. One strategy I use frequently is “Write-Pair-Share.” My students are used to this and even expect it, so I’ll probably add a layer of it right after posing the question and taking clarifying questions …(“you mean people actually buy blood?”). Also – I just discovered that the barrels they put beer in hold a different amount of liquid than the barrels they put crude oil in. Maybe I’ve consumed too much beer, but it looks like your students used the beer barrel and not the oil barrel. Anyhow – thanks again Dan! To clarify, when I said that the math solution presented was not appropriate for the “real world” question, I simply meant that the solution did not actually resolve the question that was posed. But perhaps I might have better said that the “real world” question was not appropriate for the math lesson. To be sure, the “real world” question provides a springboard for many interesting topics of discussion: When would you need to buy blood? What is penicillin used for? How is gasoline different from crude oil? Why is gasoline considered expensive? Why does inkjet printer ink cost more than blood? No doubt here are many possibilities for critical thinking here, but most of these topics have nothing to do with the math. One of the things I love about stuff like this is how so many of the things these kids need to think about naturally show up in real data. You don’t have to plan out the details; you just have to be nimble and awake. For example, the kids get—as a small part of the big lesson—a list of decimal numbers and need to figure out the order. You don’t need to PLAN to have 0.07 and 0.0086 in the same list, to trick students into thinking that 8>7 means 0.0086 > 0.07. It just happens on its own. Kev, above, mentions the potential (small) goof: that texting google conversion opaquely gave the conversion of [beer] barrels to milliliters, not [oil] barrels. Who knew they were different? So it makes me wonder, since (above) the unit price of gas is so surprisingly close to that of crude oil, does the beer-barrel correction make it closer or further away? I completely agree. Although I admire the enthusiasm of this lesson, please, teach what you’re competent to teach: math, not economics. Otherwise, you’re doing more harm than good. Your arguments regarding “expensiveness” and whether something is “overpriced” are non sequiturs. If you want to learn more about these ideas, take a class or pick up a good introductory book on micro-economic theory. Best of luck! SJA, your and Zeno’s point about the distinction “expensive” vs. “overpriced” is well taken. But your formulation of it is not constructive. Everyday money examples are necessary stock-in-trade for math teachers, especially of low-skilled kids, because the kids have experience of them and feelings about them. There’s no way around this. This means we’re bound to have conversations with them about economics. If you see something you’d like people to understand – we are in the world of organic online professional development, right here. Do it like Burt and Zeno and explain it to the rest of us. 2) your tantalizing choice to give the quantities sold in a multiplicity of units. *Then gather ideas. If there is more than one good one (e.g. somebody wants to find $ per mL and somebody else wants to find mL per $), great. If there’s less than one good one, a sequence of questions – “what’s making it hard to compare?” “what would you have to know to fix that?” “how will you find that out?” and then another 45 sec for them to think and talk. Either way, though, I’m inclined to make sure it’s their job to answer “how to find the price of one mL?” though, rather than “divide this by this – what does that tell you?” as in the video. That way, as you often discuss, it is their question rather than your imposition of structure that moves them forward. Like everyone else I totally admire your bravery in putting video of yourself on the internet for general comment (especially given the size of your readership). Also, I could totally see this turning into a whole week-long ratios exercize, via precisely Zeno & Burt’s problematization of the notion of “expensiveness.” On day one, the end goal is the price-by-volume comparison you did. (Which I agree is totally thought-provoking, and totally motivates the ratio objective, regardless of the validity of the comparison from an economics standpoint.) Then on day two, bring in Burt’s point. Actually this is the perfect use of that moment when the kid was like, “I thought oil was expensive?” (Hindsight always 20/20.) The reply: “mmmm… yeah I’ve heard that too. Save that thought for tomorrow.” Then, on day two: “we found out that oil only costs 0.06 cents per mL, less than any of the other fluids we looked at – yet so and so says they’ve heard that it’s expensive, and so and so referred to it yesterday as ‘Texas gold.’ How can that be if it’s so cheap?” I’m not sure exactly what’s next, but once the kids register the relevance of the quantities in which the liquids are used, a whole new set of thought-provoking ratios come about: as Burt asked, how far does a mL of gasoline get you? How many pages does a mL of HP ink print? I could see this going on and staying compelling for at least several days. Hmm, the official economists aren’t particularly competent, are they? This meltdown has come about in part by listening to folks who thought they knew what they were talking about. Econ is a politically motivated study, and I’d guess getting the kids to think about cost issues in new ways is useful. There’s a good case to be made that macroeconomists and financial economists were asleep at the switch, if not plain wrong on many issues, and, on that ground, bear some responsibility for the meltdown. But the notions at issue with respect to the lesson plan here are microeconomic in nature and the relevant price theory is uncontroversial as far as I am aware. As for your second point, I agree that thinking about things in new ways is often beneficial. But there was no thinking here. The conclusions that certain items were overpriced did not have any thoughtful support, and, worse, they were unnecessary given the mathematical concepts being taught, namely, ratios and commensurability. Finally, it is precisely unsupported arguments as to the under- or over-pricing of certain goods and services that are political in nature. Often, e.g., we see unsupported claims that CEOs are overcompensated (i.e., their labor is overpriced). Sometimes these claims are supported by inappropriate comparisons, such as we see in the lesson plan here. There are, in fact, good arguments that CEOs are overcompensated, but they involve notions taken from pricing theory. If you think these notions are incorrect or inadequate, then you need to explain why, or, better, propose an alternative theory. Thanks for the suggestion. I thought my formulation was constructive and simple: stick to teaching what you know. Everyday money examples might be unavoidable and even helpful to students by giving them something they can relate to. But as you seem to concede, there’s no point in getting into notions of over- or under-pricing, or even whether something is “expensive” or not, unless you are familiar with the basic relevant theory — and, perhaps more important, whether such theory is simple enough to teach to the intended students. For example, Burt makes the blanket claim that we think gasoline is expensive. But that’s not necessarily true. One of the problems that can disrupt accurate pricing is the existence of what are called externalities. Many claim that the full cost of using gasoline is not incorporated into the price, because of the (alleged) environmental damage caused by the use of gasoline. Instead, these costs are imposed on society as a whole. As a result, gasoline is cheaper than it should because it doesn’t reflect the full cost of its use, resulting in overconsumption of gasoline and harm to society. But doesn’t this seem a bit off topic? Better to stick with comparing ratios and converting between different units of analysis (e.g., Burt’s point about using utility as a common denominator). Most important, avoid jumping to conclusions. What a great posting and comment thread! As an economist who teaches MBA students by the case method, I can tell you that getting students to spontaneously think about appropriate ratio comparisons can be a problematic task. Of course, all the students in my classes are able to calculate a ratio and most of them fundamentally understand what a ratio is. But they do not always exploit opportunities to make these comparisons and they often end up doing various “apples to oranges” calculations that can be misleading. In my experience, most people who regularly use ratios or similar calculations do so in a very narrow or specific context where they have a good “feel” and often a customary “industry” template to work with. TV execs are really good at ratings and viewer shares and advertising rates per point–they are less likely to spontaneously look at something like floor space per machine and rental costs per square foot when presented with a case study that involves comparing machine costs even though they could figure it out fairly quickly if told to work on machine costs. So don’t get too discouraged with your blue students. They’ve never had a context in which this stuff makes sense. @Ben, I thought this thing had about run its course but I’m obliged for the general remarks on pedagogy. I’m pretty horrendous when it comes to Think-Pair-Share-type activities, mostly because I fail to lay any kind of foundation for them from day one and the scattershot approach I eventually favor just confuses my kids and sets them off into their own conversations about who got broken-up with the period before. The classroom dialogue you’ve outlined is pretty tantalizing, though, so we have here a second semester resolution. It turns out that barrels of different fluids(oil, gas, etc) are different volumes. I am pretty much lifting this whole piece. I love the text messaging … Thanks for all your work. Sean, I’ve had the top of the post amended since commenter #37 pointed out the same thing. Thanks for double checking me, though. I’d like someone to add “cheap” and “expensive” perfumed to the list. great idea and great comments. . .it’s so good to have a place to go and read about great ideas and glean all kinds of wonderful information from so many other great educators. I work at a internship based school where our students are taught to learn on their own in the real world. As a math teacher, I do my best to find situations when math can be applied to real world situations. This is a great example of such a “real world” thing that can use math to make valuable judgments regarding. The ideas and stuff you’re putting out there are absolutely mindblowing! This is my third year teaching math, here in Iceland, and your methods, and line-of-thought, plus all the material you are sharing with the world are helping me immensely on the way to become a better teacher. Thanks so much for all this and keep it coming please! I just graduated from high school, and I have to say I wish I had had more math teachers that taught like you. Algebra one and two are definitely the groundwork for advanced math classes, and any of your students that do choose to move on and take accelerated courses will actually be prepared. I conducted this exercise as an introduction to the use of data and information with a group of 25 nurse managers. I had them divide into groups of 5 to rank the list of liquids and then we came back together to walk through the process. (1) Every group will have a different opinion given the same information. (2) The way things actually are may be different than what you believe them to be. (3) When analyzing a situation, you need to establish a framework in order to transform data into information. (4) Data is not helpful – information is. I love you. This is brilliant. I love this idea! I did a variation of this lesson today and thought you might like to hear how it went. First off, I took off the vodka because I felt that my students particularly (in a juvenile detention center) might try to figure out the cost of making a Red Bull and Vodka drink. I replaced it with chocolate syrup. I also had my students calculate the cost per cup of the liquid in stead of cost per ml. I thought that a cup size was a bit more accessible and I actually had a measuring cup lying around in class. My students sounded exactly like yours did, “Misssss… Red Bull does not cost $51.15” was the first thing that popped in their heads. Overall I have to say this was a really successful lesson. I had students who would rather “take a zero” than do any math engaged and willing to ask questions. I also learned the joy of simply stating “that’s a really great question,” rather then saying that and giving them the answer immediately. Bam! Thanks for the recap. This style of activity also is possible with (lemonade/soda) cans: I have various sizes (airplane =250mL), standard Australian size = 375mL, European (?) size = 330mL and the “special” that they occasionally have which is 500mL. Which can is the most economical to produce (amount of material (tsa) v volume ratio) ? Why are the last three sizes all the same radius but the variable is the height (why choose that radius in the first place? eg suitable for adult male hand to grab) and the questions go on…. Best Maths lesson ever!!!!!!!!!!!!!!!!! This worked so well. I really left them hanging to calculate the unit volume on their own. Kids who I have rarely seen use a calculator ended up getting one and giving it a go. Brilliant! I’m gonna use this to kick off the work we do on ratio and best buys for my GCSE resit students in a couple of weeks.